Critical psychiatry: Could psychiatrists become extinct? Paul Harrison (who I've mentioned in a previous post), Ed Bullmore (again, who I've mentioned in another previous post) and others have posted an eletter in response to a BJPsych editorial entitled "The future of psychiatry". They argue for what they call a "remedicalised psychiatry". By this they mean that psychiatrists should concentrate on "what doctors do best" and challenge their "involvement in activities or services which are not of this kind". They suggest that without change psychiatrists will be left like "the apothecaries 300 years ago: in decline, mental health care increasingly left to a poorly coordinated coalition of other health professionals". What these authors are at least partly reacting against are the reforms, such as so-called New Ways of Working, influenced by the previous National Director of Mental Health, Louis Appleby. In a recent interview, Appleby said "I get uneasy if it starts to sound as if doctors have a natural entitlement to a unique place in mental health care". There were problems with New Ways of Working, such as not paying enough attention to the continuity between the new services created and a lack of proper emphasis on the expertise of mental health staff, not just medical staff. Department of Health policy has now moved on. However, I too, like Appleby, have concerns about Harrison, Bullmore et al's stance. The danger is that their position could be seen as saying that psychiatrists are not concerned with the personal dimension, which is actually the primary element of mental health practice. It doesn't actually matter that, for example, non-psychiatrists prescribe medication or become approved clinicians under the Mental Health Act, as long as they are properly trained to do so. This is where the debate should focus. By the way, before completing my university medical degrees, I first practiced medicine as a licentiate in medicine and surgery of the Society of Apothecaries, which could approve medical training in the UK until 2003. I had been sceptical about the value of medical training for mental health practice and gave up my medical training for 8 years before returning to complete it (see eg. a talk I gave some years ago). A patient-centred medical training is indispensible in modern mental health practice. The problem is that medical training is not always as patient-centred as it should be. "By the way, before completing my university medical degrees, I first practiced medicine as a licentiate in medicine and surgery of the Society of Apothecaries..."
Did you practice medicine under licence before you'd received your university medical degrees? So how does that work (genuinely)? I may have dropped into the middle of an ongoing conversation and not current with the terminology being used. Current psychiatry would claim that it is medicalised, that is, it treats medical conditions by medical means. This has led to concocted "medical" theories of the origin of mental illness, such as the "serotonin deficiency" theory; vague pseudo-medical diagnoses; arbitrary treatment with poorly tested medications; and an ignorance of outcomes. Does "re-medicalisation" mean re-education in organic conditions that may affect mental state, such as low vitamin B12, and treatment of those conditions? Or does it merely mean a focus on prescribing psychiatric drugs, forgoing "non-medical" interventions such as psychotherapy? If the latter, I suggest that is the surest way to obsolescence for psychiatry. It's been a discreditable road so far, and will only get more so as patients themselves revolt as consumers. It's becoming more and more obvious the medications are often prescribed inappropriately, and psychiatrists have not been adequately concerned with patient safety. Unless this is addressed, psychiatry deserves to dwindle into obscurity. Sorry, Adzcliff, I didn't mean to confuse. It used to be possible to get registration with the General Medical Council (GMC) by becoming a licentiate in medicine and surgery of the Society of Apothecaries.What people did, if they failed their university final exams (as I did in surgery), was take the apothecary exams to obtain a licence to still get provisional registration with the GMC to take up their arranged preregistration house job. I then retook my university surgery exams, but this was after I had already started practicing as a doctor in my house job. This way of qualifying is no longer possible. So although the Society of Apothecaries still exists, its traditional raison d'etre of a route to medical qualification no longer exists. This is why the authors of the editorial and the eletter make reference to the apothecaries. What they're worried about is that psychiatrists will become extinct like apothecaries. I actually think its a false analogy. 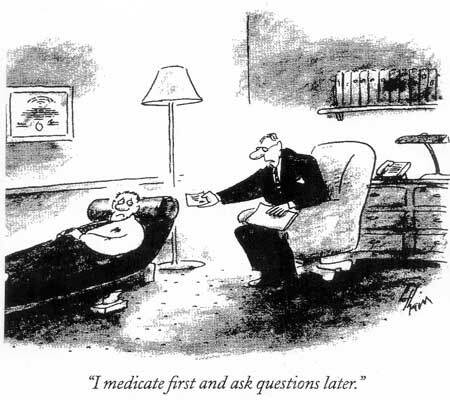 Psychiatrists haven't always been in charge in mental health practice anyway. For example, the York Retreat was opened by a layman, William Tuke, in 1796. That's not to say doctors didn't play a role. The original superintendant at the Retreat was a retired medical practitioner, who unfortuately died after 2 months and was replaced by an apothecary. What the authors of the eletter are really worried about is the loss of medical authority. That's why they call it a remedicalised psychiatry, Altostrata, because they want to get doctors authority back, but as you say, they don't seem to be going about it in the right way. Doctors have always had a role in mental health practice and will continue to do so - its interesting that psychiatrists feel panicked that this may not be the case. Thanks for the explanation Duncan - learnt something new there!